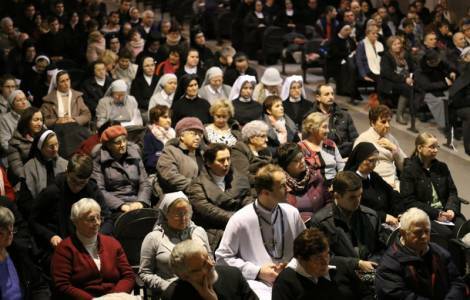 Czestochowa (Agenzia Fides) - More than 400 people gathered on 3 and 4 December, for the feast of St. Francis Xavier, at the Sanctuary of Jasna Gora for the missionary study meeting and prayer vigil promoted as usual by the Pontifical Missionary Union (PMU) of Poland, according to information sent to Agenzia Fides by Mgr. Tomasz Atlas, National Director of the Pontifical Mission Societies. This year's meeting wanted to celebrate the centenary of the PMU in a special way. His Exc. Mgr. Stanislaw Gadecki, President of the Polish Bishops' Conference, presided over the opening Mass, on Saturday afternoon, December 3. Recalling the missionary work of the Patron of missions, he stressed the value of the PMU for the spread of the missionary spirit in the universal Church. In the missiological session, the participants listened to the speech of His Exc. Mgr. Henryk Hoser, Bishop of Warsaw-Prague, a former missionary in Rwanda, who presented the current challenges to the PMU. Therefore Fr. Marek Tatar, professor at the University Card. Wyszynski, illustrated the theme "From baptism to mission", and Fr. Stanislaw Urbański focused on the missionary ministry of Holy Mother Teresa of Calcutta. Then it was the turn of Juan Carlos Araya, IMC, a missionary in Argentina.